What can I say about Taim that hasn’t already been said. I think at this point everyone has heard of Taim and their ridiculously delicious Israeli style falafel, but there’s another dish they make that I constantly obsess over. 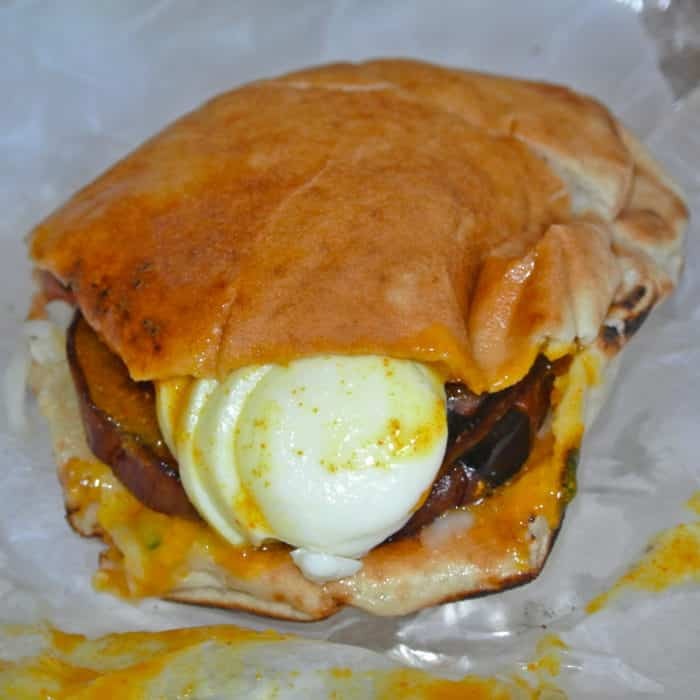 In fact, the lesser known Sabich Sandwich is my favorite vegetarian dish in NYC. 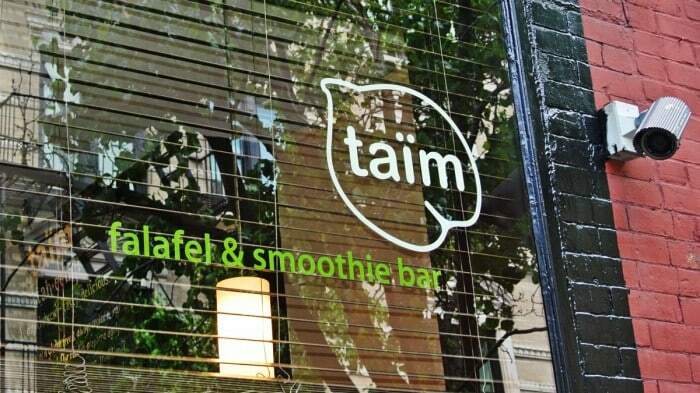 On this trip, I visited the original The West Village Taim location. Though they have expanded to included another one in Nolita and added a roster of mobile food trucks, I still like coming to the closet-sized original. 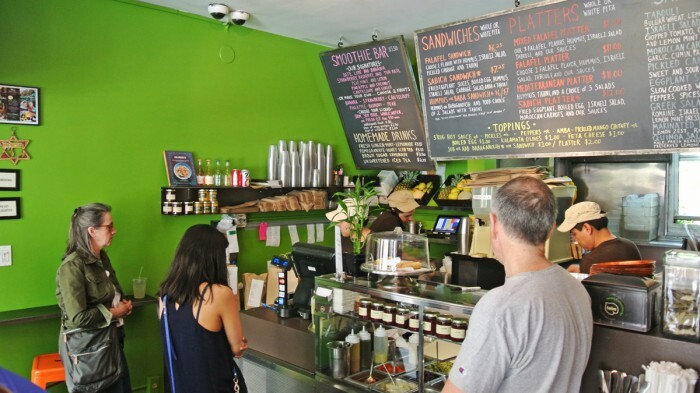 And though it’s small, people still manage to squeeze their way in to get an authentic taste of Israel in the West Village. If you’re lucky, like I was, you’ll drop in during a lull in the crowd and find yourself with no line of people to come between you and that glorious Middle Eastern food. 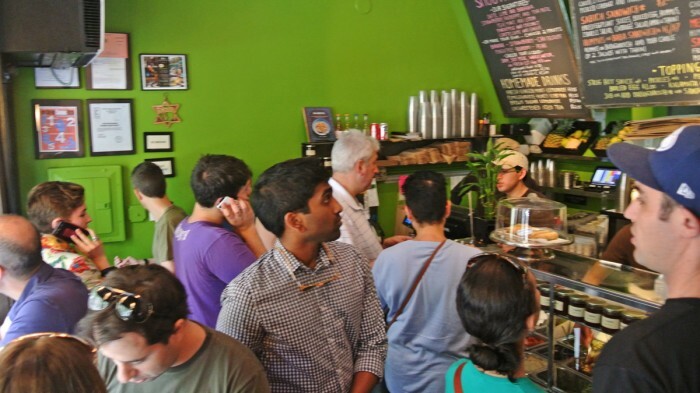 But once you do get past the inevitable line, I know you’ll be tempted to order a falafel sandwich. Don’t do it. Those are very good, but avoid your impulses and get the lesser known and lesser publicized Sabich Sandwich. Trust me on this. 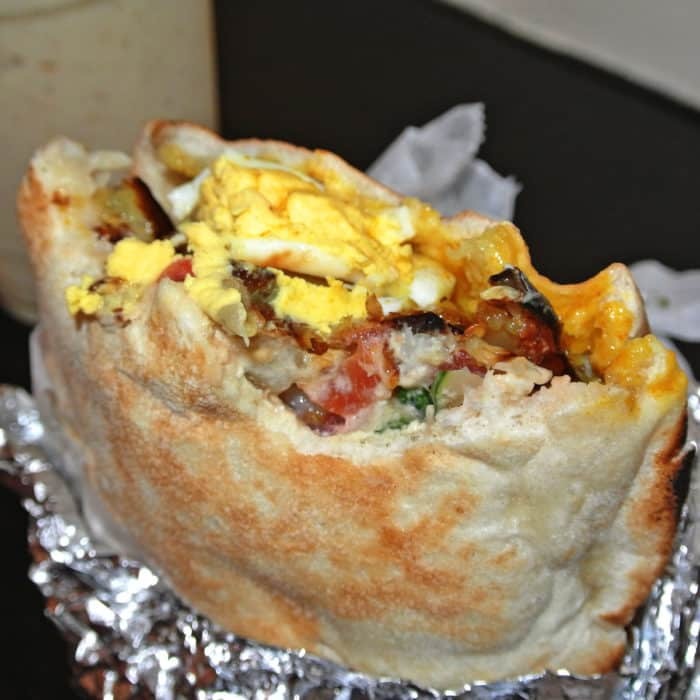 A sabich starts with one of Taim’s excellently fluffy pitas just like their falafel sandwiches. Instead, they slice it open and over-stuff it with fried-to-order sliced eggplant, a sliced organic hardboiled egg, parsley, hummus, Israeli salad, pickled cabbage, tahini sauce, and amba. Although you may not be as familiar with amba as some of the more standard Middle Eastern sauces and spreads, in my opinion, that funky sauce is what makes the sabich sandwich so incredible. Amba is a glowing orange-colored, spiced, pickled mango chutney sauce that adds a really unusual flavor to the whole thing. I have no idea how this strange sauce came to be a standard topping found in most respectable Israeli falafel shops, probably from the Iraqi Jews if I had to guess, but I’m sure glad it did. It has a very bold flavor that honestly probably isn’t for everyone and I’ve been told that if you consume it, you’ll reek of it all day, but that’s just too bad for whomever I have to deal with that day. Because that sour, sweet, spicy, runny sauce is so good and does such an excellent job perking up my sandwich. So if you’re looking for some incredible take-out Israeli cuisine and don’t want to stick to your tried-and-true falafel standby, head to Taim and try a sabich sandwich. Just make sure to use the magic words “with everything” so amba is included in your sandwich. 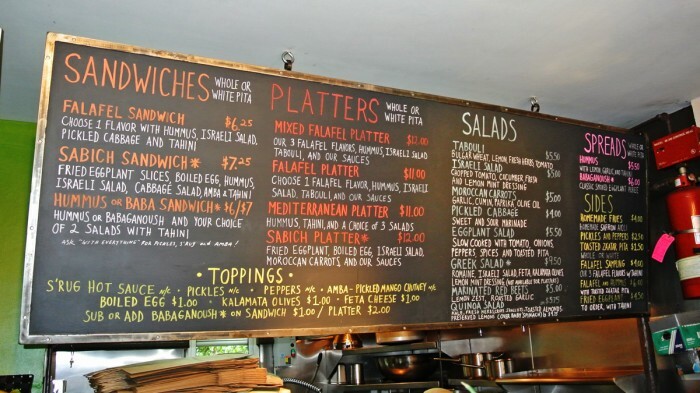 As we all know, their falafel sandwiches are great, but especially with the inclusion of amba, the incredible sabich so good that I can confidently claim that it’s my favorite vegetarian dish in the city. Got another great Middle Eastern joint in NYC I need to check out? Let me know in the comments below.